All cervical injuries (± neurological involvement) should be referred to the neurosurgical team on call. All thoracic and lumbar fractures (± neurological involvement) should be referred to the Orthopaedic team on call. Fractures, dislocations (produce anterior displacement). 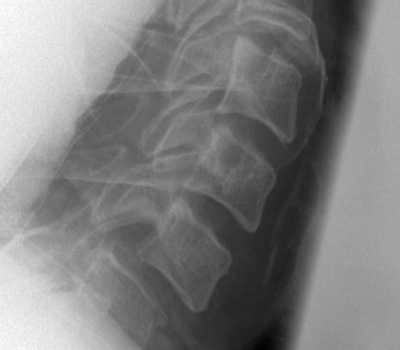 abnormal separation of spinous processes. 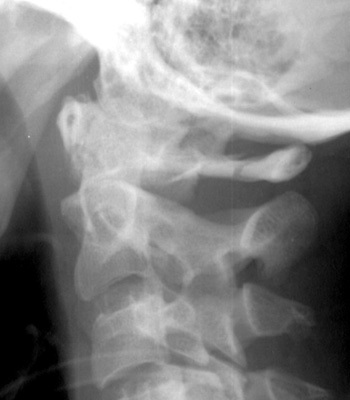 increased atlanto-odontoid gap (3mm in adult, 5mm in a child). AP and open-mouth views of the odontoid may need to be taken later in the X-ray Department. If you can't see C7/T1 request a swimmer's view. 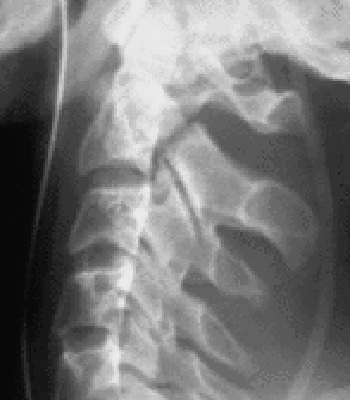 Thoracolumbar x-rays should be performed on all patients with multiple injuries or an accident mechanism with sufficient force that thoracolumbar injury could occur. A wedge fracture of thoracic vertebra may not be detected on log roll. Place head in neutral position, if deviated, during initial assessment or resuscitation. (Refrain from this if pain worsens or neurological symptoms develop during the manoeuvre). Restrict movement by means of firm collar, sandbags each side of the head and forehead tape. (Firm collar only if patient uncooperative). Enquire about pain - site, radiation, neurological symptoms, e.g. numbness and weakness. Perform a full neurological examination and include sacral reflexes if evidence of cord injury. Obtain lateral cervical radiograph C1 - C7/T1 ± caudal arm traction. If C7 T1 junction still unclear, request swimmer's view. 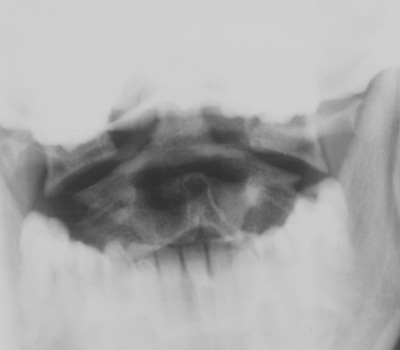 increased atlanto-odontoid gap (3 mm in adult, 5 mm in child). C1 - C3 spinolaminar alignment. 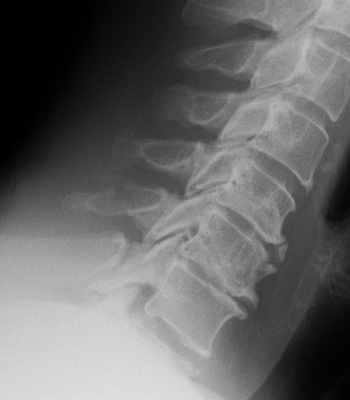 If there are neurological symptoms or signs (but no spinal cord injury), the x-rays are abnormal or the patient remains in significant pain, refer to the ED duty doctor (see clearing the cervical spine). Skull traction tongs are available in the ED if required by senior staff. For more labelled x-ray please see Radiology. 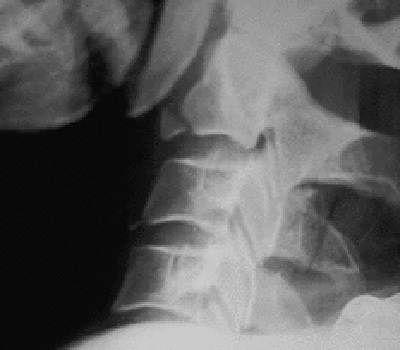 Correlate history & examination when deciding whether or not to x-ray patients with neck sprains. Higher velocity, fall from a height, vertebral tenderness and neurological symptoms (ASIA Form if neurological signs) are the more important indicators for x-ray. If all radiographs and neurology are normal and the patient can mobilize well, treat with NSAIDS and refer to GP (Please see clearing the cervical spine section). Arrange review in ED or physiotherapy if concerned. Early mobilization in neck sprains speed recovery [Bestbets]. Please provide all patients with verbal and written advice about neck sprain. Referral to a chiropractor is not indicated [BestBets]. Patients with stable fractures may be sent home with analgesia to rest but admit if unable to stand or lack of support at home. Fracture Clinic follow-up should be requested. Beware of HYPERtension which may indicate autonomic dysreflexia. NB: Unstable injuries are associated with dislocations or fractures resulting in separation of the anterior and posterior vertebral complexes (e.g. fractured pedicles). The more common stable injuries are confined to simple wedge or crush fractures of the vertebral bodies and fractures of the transverse or spinous processes. A burst fracture is an unstable comminuted fracture of the vertebral body with posterior displacement of fragments which may impinge on the spinal cord. 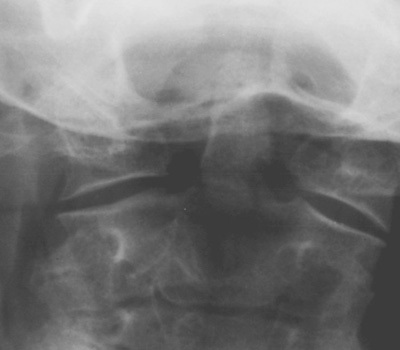 Compression fractures are associated with fracture of the os calcis produced by falling from a height. Improve motor fxn and sensation. Reduce extent of permanent paralysis. The US National Acute Spinal Cord Injury Studies (NASCIS) have shown that the administration of Methylprednisolone within 8 hours of blunt spinal injury may improve neurological outcome. ASIA Form. The potential benefits must be weighed against the potential harm (e.g. sepsis, gastric ulceration, pancreatitis). Please contact your local neurosurgical service or national spinal unit (Mater Misericordiae) for advice. Mater Hospital Spinal Unit advise against steroids in acute spinal cord injury. Open wounds require surgical exploration. Timing of surgery (closed cord injury) is controversial. Surgically remediable cord compression due to dislocation of a vertebral body or displaced bone fragment must be treated urgently (within 2 hours). Even stable injuries can be associated with significant cord compression and may benefit from decompression surgery. Early decompression has also been advocated for incomplete lesions, especially if the motor signs progressive.